I always enjoy trying worldwide-known sweets and snacks that utilize Japanese flavors. Kit Kat and Doritos are two famous brands that first come to mind. Mentos is another. This is a re-release from a few years back. It was popular then and I predict it to be just as sought after this time around. "Ume" is often translated as Japanese plum (or apricot) which is a golf ball sized fruit that contains a pit. It is very sour with a Western plum zest, but also has a fragrant flower-like taste. Japanese people also enjoy them pickled as "Umeboshi" where they become ever more sour. How will these Mentos match up in flavor? 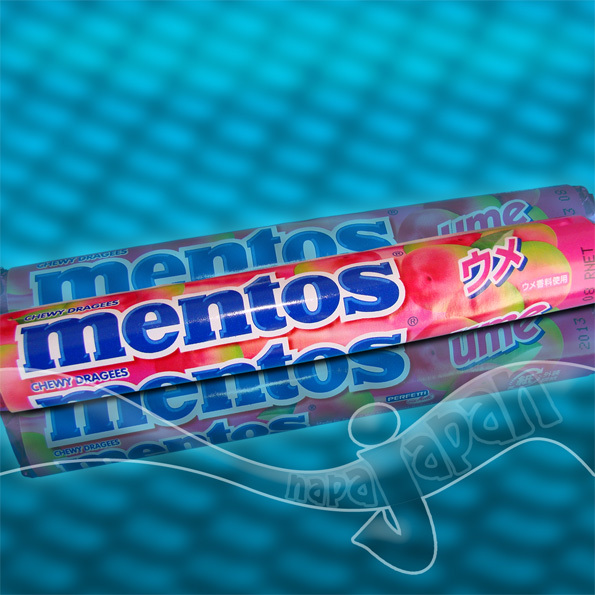 Japanese Mentos are actually made in Holland by Perfetti Van Melle Breda but are distributed by Kraft Foods in Tokyo. The wrapper is bright and colorful with the flavor written in both Japanese and English. The 14 chewy dragees (Dutch talk for candies) are sealed nicely in bright pink foil within the 14cm long tube wrapper. Each candy is approximately 2 cm in diameter and 1 cm thick. When first placing the candy on my tongue I sense an icing sugar flavor with the ever so slight taste of plum flower extract. Even after a minute of sucking the semi-rough, hard outer layer there is very little Ume coming through. Then the candy becomes smooth to a glass-like finish and bursts of flavorful plum come through. I enjoy this for a few seconds longer and finally start to chew it. There it is! That wonderful balance of sweet and sour Ume is filling my mouth making me very satisfied. Right down to the last chew the strong Ume flavor remains and I am quick to put another dragee in my mouth. Wonderful stuff! No wonder this was a hit in the 2000s. A great feature about Mentos is that they have a very long shelf life. The expiry date on these is August 2013 (nearly two years from when I write this blog post.) Stock up so you can enjoy them for a long time. Limited edition flavors like this do not stay on store shelves for long. We offer all the current flavors HERE. 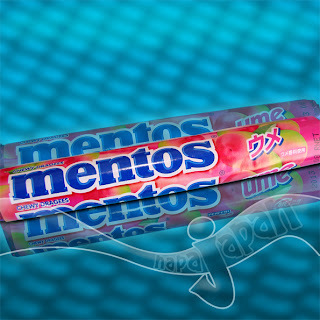 Please leave a comment about your most memorable Mentos experience. I thank you for reading this post and encourage you to share this with your friends if they have not seen such a product. napaJapan specializes in hard-to-find flavors and products from Japan. Come by anytime and see what is in store. Our site is live and well around the world. We have many Singapore customers. Please try again...perhaps the server was down at the time you tried.